There was no doubt that hearing Daniel Avery play at 8 p.m. was a bit of shock to the system, but he eased everyone into his set with a deft hand. The hypnotic "Stereo L" got the proceedings sauntering down a languid wormhole. We were hand-held through the first part of his set, as it quickly became apparent that the visuals on display were the exact ones he had chosen to accompany every track from his latest album, Song For Alpha (a quick Youtube search of the record will show you just what we mean). With his music being such a rambling stroll through digital pathways, Avery often just stood back and let the music do its thing — it seemed he was just as entranced as everyone else. Heavier tracks, like "Sensation," gave way to ambient interludes throughout, but you were never too far away from something grizzly kicking back in. The last 20 minutes of his set were a ramped-up romp of techno and Warp-Records-esque IDM, closing with the '90s anthemic stylings of "Clear." 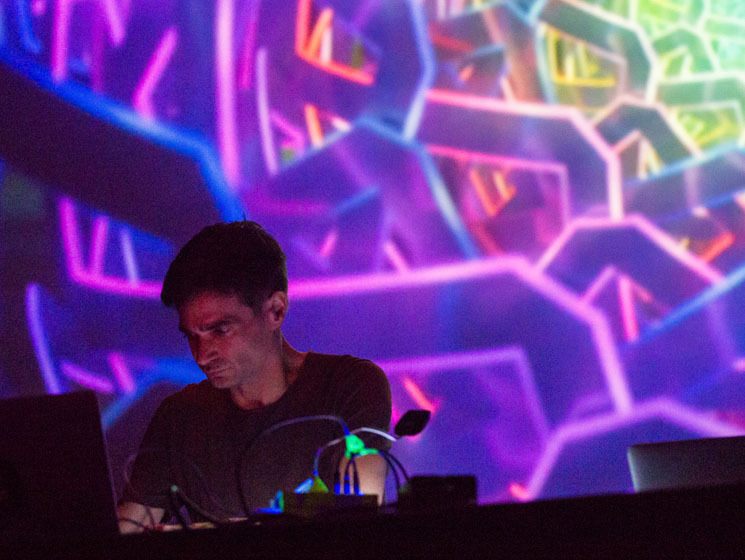 There are few who can set the stage for Jon Hopkins, but Avery did a near-perfect job of prepping us for the glories that were to come. Some kudos have to be given to the Danforth, because there was virtually no gap between both sets. As soon as Avery's table was wheeled off, Hopkins appeared on stage and dove straight into the title track from his most recent album, Singularity. The visuals started off slow (as did the track), closely resembling a neon heart-monitor pulse that quivered with every note. Hopkins can certainly turn it up when he wants to, and from the punch of his opener, it was clear that this was going to be an onslaught of chunky sonics. As you might expect, he followed it with "Emerald Rush," the second track from that album, which showed the British producer's penchant for ambient tracks that still pack a wallop. For a brief moment it seemed as if Hopkins was getting ready to run through Singularity in its entirety, but as the euphoric splendour of "Everything Connected" ran into "Open Eye Signal" — one of his career highlights — it became apparent that this wasn't to be the case. Much of the orchestral fare from his latest album, while splendid in its own right, wasn't exactly what the crowd were looking for at his Toronto show. Luckily, "Open Eye Signal" scuppered that notion in no time, just by being the beast that it is. The music video, which shows a troubled skateboarder taking flight, was on display the entire time, but just like the song itself, was warped by colourful sunspots. It's hard to pick a defining moment in a show so rife with zeniths, but when that track kicked in (possibly for the third or fourth time) it was blatantly clear that we were dealing with someone who's mastered his craft. While this was advertised as a live set, some tracks — like Mica's "Miss Shine" and sections of "SML" by Alberto Gianelli — seemed to be emanating from the stage. This could've been merely due to Hopkins's all-encompassing style, but one thing we're certain of is that his remix of Disclosure's "Magnets ft. Lorde," towards the end of his set, was a magical moment in time. While everyone had no problem dancing it up at Hopkins's Danforth show, the majority of people couldn't help but pause once in a while, just to soak up the body-curdling majesty of it all. Few shows can tickle your muscles and your lobes simultaneously, but Hopkins's Toronto performance proved that you can have equal measures of both and still get lost when you felt like it.